In view of the move of UK TV channels to a new satellite, this topic is opened for discussion and advice on the need to have a bigger dish. This first post is repeated from another associated topic, but this topic will be reserved solely for Q&A on the issues which are now beginning to be apparent. I am sure a lot of people are going to need advice about new installations over the coming months. The new sized dish Algarve residents will soon need to continue to receive UK Sky and Freesat broadcasts. Seriously, everyone is going to need a bigger dish sometime soon as the channels migrate to a new satellite platform Astra 2F. Some theories are that a 3 metre dish might suffice down here, others that it might have to be as big as 5 metres. No-one really knows yet. All the places I have read say that it is too early to say exactly what the effects will be, although with some channels (eg Channel 5) already moved reports I have seen posted (and have heard at first hand) from the Algarve say that with a 1.3 metre dish (the current norm) no signal can be seen from Astra 2F. It gets fairly technical, but I am sure your satellite man is one of many trying to get to grips with the situation, which is far from clear. It's the Uk spotbeam that's the issue. If UK broadcasters use this, you can clearly see from the maps that it doesn't come anywhere near here and even the pan-European footprint hardly brushes the Algarve. It's started. Lost channel 5 and the USA channel 5 already. Bob your BBC ITV channels where were they broadcast from? all mine came through channel Isles + channel5. Originally ITV came from Anglia & London and always breaking up but have had a good signal from the channel Isle ones on all channels.Not sure what the outcome is now though as we are back in UK. 2013 - oh no 50!! I've recently investigated this extensively, and took advice from a number of sources, including several established satellite installers in the Algarve. I was told that a minimum 1.8m dish is now required to view Sky/Freesat down here, but even that will probably not be big enough in a couple of years time. The end result will be that for most people, watching UK TV in the Algarve will gradually be eliminated because they cannot accomodate dishes of that size on their property. Of course, the long term aim behind all this is to prevent anyone outside of the UK from receiving UK broadcasts, and this objective, sooner rather than later, will be realised. Therefore, investing in a new bigger dish may solve the problem in the short term but eventually watching UK TV here via satellite will be a thing of the past. Naturally, these local Foreign broadcasters are not happy if they've paid out a lot of money to buy these exclusive rights only to find that the programmes can be watched on a service that is essentially designed for viewers who are resident in the UK and in many cases, from the very same Company that that sold them the rights to show these events, exclusively in their own Country, in the first place. It's the same reason why you can't watch BBC iplayer abroad. Likewise, if you listen to Radio 5 over the internet, you can listen to everything except live football comentaries - as soon as they start, you're automatically blocked from listening. well end of day Sky will lose a lot of revenue from expats & bars/businesses owned by expats etc all over Europe who are subscribing through a UK address, for freesat or whatever programmes, after all its still money in the pot for sky. 1.8 dish minimum size,mmmmmm some forums are saying even with a 2.4 or bigger they have lost channels even now with the switch over. Who knows, only time will tell. I for one won't be forking out for a big dish ( which I can accommodate) only to find maybe a year later it won't work. It's all small beer compared to the money involved in Premier League Football rights. The Premier League will receive Â£3 billion for TV rights over the next 3 years from Sky & BT, who have replaced ESPN. Sky's share of that is a staggering Â£2.3 billion. "Likewise, if you listen to Radio 5 over the internet, you can listen to everything except live football comentaries - as soon as they start, you're automatically blocked from listening." Find a reliable UK based proxy server and you can bypass the block. I am listening to the Test Match as I write (blocked to non-UK IP addresses as BBC is not the host broadcaster) and regularly listen to otherwise blocked football. You can find out which TV and radio channels are migrating and when at this forum. An Albufeira.com regular (satellite man Patrick aka Ziproz) is a contributor. I hadn't realised until I read it that many UK channels were being broadcast to this area via Astra 1N, which was a temporary fix when one of the other old satellites went wrong a while back. Astra 1N's footprint included right down to the Canary Islands, by accident of a Spanish requirement, rather than by design. Astra 2F and the other new ones are configured for the new wave of HD and 3D TV broadcasting, digital radio plus the rise in internet and other services. The UK signal needs to be more concentrated on the areas is it supposed to serve ie UK. Sky are probably privately moaning into their beer about the potential loss of several tens of thousands of subscriptions from Spain and Portugal, but they have no remit to provide services here. Copyright issues have never seemed to exercise the Portuguese and Spanish TV companies, otherwise every bar advertising Sky Sports would have been raided long ago. Perhaps a solution for condos would be a big dish in the garden, a receiving station with a mini-network cabled out to the apartments. But that would cost Â£Â£Â£ and will never get agreed to because of the non-British occupants. The money actually goes to the Premier League who are completely seperate from, and have nothing to do with, the FA. The FA only control The Championship, Leagues 1 & 2 etc and the Cups. However, the point I was trying to make was that if you take SportTV as an example, they will have paid the PL a lot of money (in addition to that already paid by Sky & BT) for exclusive rights to show PL games in Portugal. 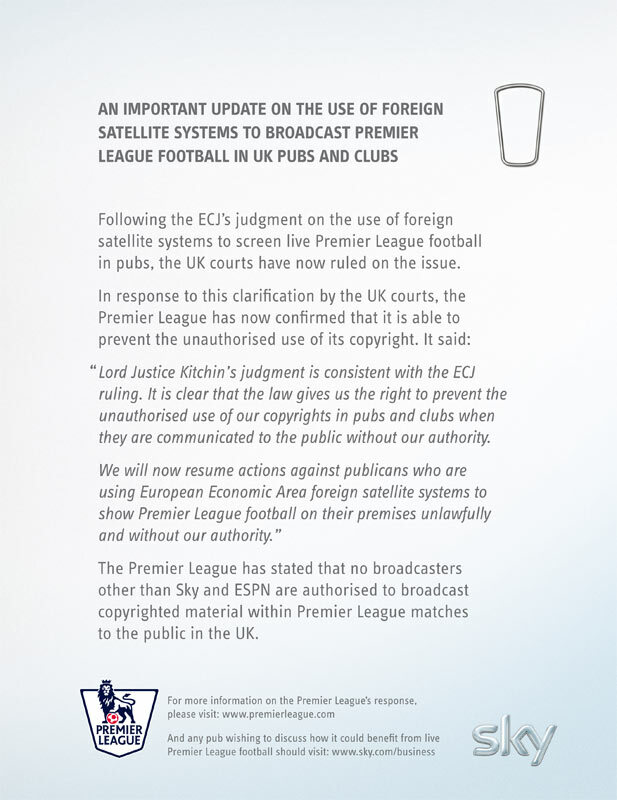 Therefore it is contrary to their agreement with the PL when viewers here can get it from Sky, who only have the rights to show the PL in the UK. Technically speaking Sky should not be showing PL outside of the UK but given the nature of satellite TV this has, up until now, been difficult to control. I would imagine that most bars in the Algarve get their PL games (that they call Sky Sports) from other European broadcasters as I doubt that many of these bars can afford Â£1,000 a month - the going rate for a pub/bar to show PL games from from Sky. Of course they might be using a "normal household" Sky viewing card but using one of those to show programmes in pubs & bars is illegal. However, most Algarve bars advertise & show games kicking off at 3pm on a Saturday afternoon. This is strictly not allowed in the UK so for those games at least bars will not be using Sky broadcasts. I understand the point you were making, but that has nothing to do with Sky's agreement with the PL/FA, they will still pay the same amount for the rights but will recieve less income, ergo, they will lose out. I can't speak for the rest of the Algarve, but in Albufeira the vast majority of bars do have Sky Sports ( paying the domestic rate, or via another route ) and A.N. Other supplier for the 3PM game. There are quite a number of well off folk who have Sky in their villas as well.